Why Use Plaster for a Hump Mold When You Can Use Unfired Clay? 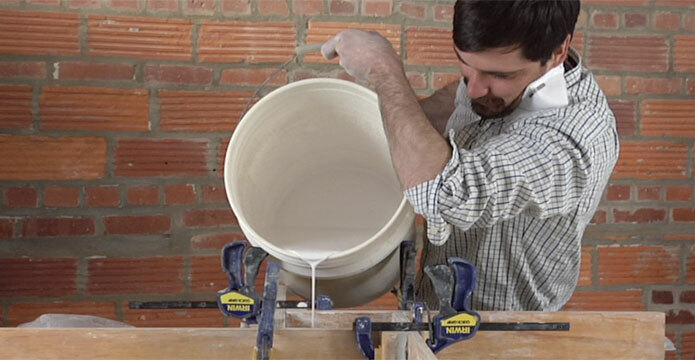 Plaster and ceramics go hand in hand and it is what many potters use for a hump mold. Some potters prefer to keep plaster out of their studios and would opt for a bisque mold. But potter Lauren Sandler has been making hump molds for her work out of unfired clay. Yes, you read that right! Unfired clay! This way she doesn’t have to deal with the mess of mixing plaster, doesn’t have to wait for her molds to dry and be fired, plus, if she gets tired of the form, she can reclaim the clay for some other use. Now, I don’t mean to diss our good friend plaster, but I do love the simplicity, speed, and versatility of an unfired hump mold. Check it out and see if you agree! – Jennifer Poellot Harnetty, editor. Bowl forms are particularly interesting for decorating because they provide an expansive landscape to explore. A generous open object when functioning, a bowl acts as an offering yet also as an object of containment—a reservoir of reverie and reflection. It’s this paradox of offering and containment that I find most alluring and attempt to expand upon with my surface work. Begin by making a clay mold that will be used to drape a slab over. The mold will be used to make the bottom quarter of the final bowl form that will then be built up to the finished shape and height with coils. The hump mold is made upside down and solid-later it will be turned upright and hollowed out. I start by drawing a boundary line to follow by first cutting out a paper pattern for what will be the top of the mold (when upright) and outlining that on the bat (figure 1). I begin the mold with a large thick slab, cut around the drawn line then add and remove clay as needed to create the desired form (figure 2). Take your time in shaping the mold; even out and smooth the surface with a Surform tool or rasp, then refine the shape and the surface with metal and rubber ribs. Place a bat and a torpedo level on top of the form and make any adjustments needed until it is level (figure 3). Once the mold has set up to a firm leather hard (wet enough to hollow out, but firm enough to hold its shape when handled) turn it upright and examine it. Check the shape to assure that the shape is what you’re looking for and add or remove clay as needed. At this point you can hollow out the form leaving ½-inch thick walls (figure 4). Once finished, let the mold dry for a few days. The mold doesn’t have to be bone dry before using-just dry enough so the slab won’t stick to it. For a longer lasting mold, you may want to make a plaster one; although I have been using some of the same bone-dry clay molds for a couple of years – and that includes many moves. The edges will often chip, but I usually cut the bottom part of the slab off above the chipped parts so it doesn’t interfere with the form. Roll out a 1/8-1/4 inch thick slab that’s large enough to drape over the mold (figure 5). I usually make a slab large enough to get two to three pieces out of it. Don’t let the slab get too dry before using it or it will crack when draped over the mold. I prefer my slabs on the wet side-just dry enough so they won’t stick to the mold – I let them do most of their drying on the mold. Place the slab over the mold and shape it to the mold. Once the slab has stiffened enough to hold its shape, cut off the excess clay from the bottom using an X-Acto knife (figure 6). Swiftly lift the slab up, loosening it from all four corners and stand it upright. Even the rim using a Surform and bevel the inside of the rim to prepare it for a coil (figure 7). Check the level of the pot again here. You may have to gently tap the pot on its foot to make sure it’s level. Wrap the rim with a damp paper towel and plastic to prepare for adding coils. Leave the bottom unwrapped to stiffen in order to support the weight of added coils. Because of the setting up time needed in coil building, I work on many pieces at once, putting another slab on the mold right after I take one off. I can build this form in one day, but time varies depending on the size and complexity. Roll out a large coil the length of the circumference of the pot’s rim. I use a thread to measure the rim and coil. Slightly flatten the coil with your hand and bevel the edge that attaches to the interior beveled edge of the pot with your hand or small rolling pin. Add the coil, overlap the ends a bit and cut through both. Bevel both ends and attach (figure 8). You don’t need to slip and score since the clay is wet enough to be blended together easily. Blend the coil to the interior of the pot first, then Surform the exterior where the coil and the wall meet to smooth it out and add and blend a small coil around the exterior (figure 9). Repeat these steps until you get the desired size. Once you have the desired height and volume, even out the rim with a Surform, then measure and mark the four corners of the rim using a string and ruler. Decide how much of a curve you would like and mark the lowest point on two opposite sides of the rim. Use the Surform to cut the clay away moving from one side to the other (figure 10) to maintain the same amount of pressure. Once you have the curve defined, smooth the rim using your fingers or a rib. (figure 11). For more information or to see more of Lauren Sandler’s work, please visit www.laurensandlerstudio.com. Add:, bisque, bisque mold, bone dry, bone dry clay, bowl, bowl form, building, ceramics, clay, clay molds, coils, cut, decorating, drawing, dry, edges, foot, form, forms, hump mold, hump molds, leather hard, mixing, mixing plaster, mold, molds, paper, pattern, plaster, pot, potter, potters, rib, set, setting, shape, size, slab, slip, support, surface, surform, time, tool, visit. Such a Wonderful Idea for Mold Making, Thank you. i’m wanting to make some square slash oval plates shapes and was struggling with the mould warping in the usual hand built form way! I use this same technique, only I make the mold out of Magic clay (nylon fiber clay made by New Mexico Clay). i use the inside of the mold as a slump mold and the outside as a hump mold. Magic Clay s stronger even than paperclay and doesn’t stick as much as paperclay. I find that painting over the surface with Gesso and letting it dry is an effective release surface, and still doesn’t interfere with my ability to reclaim the clay for another mold. LEVA – Delighted to hear you make figurative porcelain sculptures! Please e-mail me at cminor27@windstream.net. I have so many questions to ask you – such as – you must use the inside of the hamp molds. Do you press porcelain clay onto the clay mold? Most of my figurative sculptures are two feet high. So, if I put the molds together (at least 3 or 4 piece molds); I fear the porcelain slip would leak. For my small figurative figures, I had many more pieces of plaster. Would appreciate helpful ideas and knowledge. Thank you ahead of time! Wow! I love reading these ideas. I have lots of experience in making rubber molds with plaster mother molds. However, rubber is very expensive and so are the bronze sculptures. Have been trying to use plaster to make molds over clay figures and find it messy and piece molds are lots of work and heavy. Will try out some of these ideas as an alternative. Wish me luck! Thank you for your generous impute. Oh, The shape is very unique, beautiful. It is so strange. It feel interesting to make pot from clay. The people is hardworking to make them. I have heard from my friend is to have many new designs on http://tkpottery.com/ to satisfy people who love ceramic pot. This is a great technique for so many reasons. It is “green” because you can recycle the unfired clay mold. You can make the mold an off-round shape. Not all your pots end up with the same profile because you feel you should use a permanent mold to justify its storage. Being hollowed out and tapered means similar shapes have the potential to be stacked, perhaps carefully with padding. I don’t recommend dusting with clay (silica) or talc (asbestos), as some posters have suggested. Corn starch has even replaced baby talc for babies. I made a pouncer (ball) filled with corn starch, to dust the work surface (in this case, mold). Cut two lengths of ladies stocking, one layer inside the other. Tie a knot at one end. Fill the centre with corn starch. Tie the loose end to the knotted end with a double knot. Sit it in a bowl or plastic container so it stays clean between uses. Tap the work surface (or mold) with the pouncer, then brush with your fingers to even out the layer of corn starch. You need only a thin layer to be effective. hi folks, i enjoyed reading all of your comments. yes, bisque molds would definitely last longer than molds that aren’t fired. i started working this way because i liked how quickly i can start using the mold, and i would sometimes even change the shape slightly even once it had dried by damping the mold and taking the surform back to it – although you can do this to plaster as well. It is as strong as bisque without being fired and has the advantage of rewetting for shape change by addition or subtraction. A bit of powdered kaolin works just as well. Try a bit of talcum or baby powder on the mold. It acts as a release agent and burns out in the bisque firing. Diann – to avoid cracking take the piece off when it is just dry enough to stand on it’s own. Work your way around the edge several times while pushing up with your fingers to release it. If the clay has shrunk enough to release itself from the mold then it may already be too late. I have a number of plaster hump molds but I don’t know how to use them appropriately…everything cracks, warps or sticks while getting it off the hump. Any advise out there? I would like to try the clay hump mold, but getting the form off the clay seems to be a problem also. What is the critical timing for taking the formed slab off the mold? You can find a sureform tool at the hardware store. It’s like a cheese grater for wood. Just ask and they’ll take you right to them. I love using clay molds, and I’ve used green clay while waiting for a load of bisque to be ready to fire, but I never thought of using it without firing it ever. Great idea if you only want one or two uses, too, as someone else said. I do prefer firing it, though. It’s more durable of course, and because it can be thinner and still not break, you can either build a bowl, etc. on the outside or the inside. I’ve used plaster molds, but for what I do, I honestly prefer bisque molds. I love all sorts of hump molds because handbuilding is so much fun, and challenging. Thankyou, I use hump moulds a lot and hadn’t even thought of using clay. Oh the possibilities..
Francine, a surform has a rasping surface rather like a coarse cheese grater. Check your local hardware store. It’s another of those very useful clay tools that started life with a different purpose. Of course, they can also be bought online from most clay suppliers, and come in different sizes, some curved and some flat. Excellent idea, especially when you’re not talented to work on a wheel but you want to make bowls! Thanks! I’ve not had much luck with slump molds in middle and highs school classes that only meet for 50 minutes, so I use wheel thrown, bisque fired bowls for press molds. If the students aren’t finished by the end of class, they can pop the bowl out of the mold, place a piece of plastic inside the bowl and put their pot back inside for support. They fill the bowl with plastic, wrap the entire set in plastic and it is ready to continue working on the next time they have class–which can be days later. Because the bisque pot is so porous, when the two pots are in direct contact it absorbs moisture from the new pot and the new pots shrinks away from the press mold encouraging it to release. Students can alter the shape by adding or altering the rim, paddling it into a new shape, and by forming the walls with shapes that will only show up on the outside of the pot once the inside has been smoothed. Nothing beats the immediacy of this technique. Thanks for sharing Lauren! I used clay hump mould for my figurative porcelain sculpture, it`s a great way to do it! Especially if you make only one of (or few) pieces from one mould. Cheese cloth works wonderful on all kinds of bowl molds, just pull it kind of tight over the mold so it doesn’t leave wrinkles, tuck it under, and let the bowl just get to leather, and flip it over in your hand and the bowl mold will come right off, you can use more than one layer too, and that will pad it a little to allow shrinkage so you have more time before it cracks. I have used this meathod for soup bowl functions when I had 30 of 40 people doing bowls all at once, and only one person to pull the bowls off, at the perfect time. I am going to try this. Thank you got sharing your creative methods. Interesting idea, but for me, there is no sub for plaster. Now, once someone comes up with a storage solution for molds in general, give me a yell! For those of us that use molds, that is the real problem. Thanks for all of the info Ceramic Community. It’s why I love ceramic artists! I am going to teach a community ed class next week about making dishes over slump molds and was dreading the process of using plaster in my ceramic studio. I was wondering why I couldn’t just use bisque molds! If the class is a success I will have the molds to teach it again next year. I’m glad also to translate my ability to throw into a two night class for community members. As a newcomer I am really enjoying all the articles. My Daughter and I run a small ceramic studio in Yorkshire England, I was very interested in all the comments above. We tend to use bisque shapes some we make , but will try clay shapes. baby oil is quite useful to stop clay sticking. Happy potting Val. what a great ieda for beginner students who want to make their own work straight away with clay.shona from new zealand. I don’t use hump molds often but when I need an unusual shape I take a tip from Billye Singer of Las Vegas. She suggests using construction grade styrofoam. It is easily shaped and smoothed. Just remember to use a mask and work safely. You can take anything you like – an existing form of some kind – like a metal or plastic bowl or rock or a specifically formed “wet clay wraped in plastic sheeting hump mold shape” and simply wrap it in a stretchy T-shirt fabric (a great use for worn out T-shirts)then trim excess fabric and secure underneath with duct tape or something (a rubber band works fine underneath bowls, and a heavy “wet clay wrapped in plastic form” simply holds the T-shirt fabric in place via gravity). Wola! Almost-instant-hump-mold. You can also loosly wrapp an old picture frame (put a board or plastic-wrapped foam core where glass goes) with T-shirt fabric, duct-taping fabric underneath to make a great square/rectangular slump mold for plates/platters. Ease clay slab in like pie-crust from outer edges of slab (no fingers mashing clay in center needed), trim some of the overhang (to about 1/2″ from edge of mold), drop mold from about a foot off table/floor, clay flattens down nicely to fit into the contours of the frame/mold. Trim remaining excess clay to desired size/shape. Nice article and good comments to boot, even Dennis’s-thinking about how we can promote reusable materials in the art room is an imortant step towards ensuring our future. Unfired clay is a great mold material for the class room because it can be easily recycled and reused. Politics aside, I’m a purist myself and enjoy the more organic approaches to teaching and working in clay such as this one. Cheers to this! Do you think the next generation will be strong enough to demand biodegradable packaging or will they be as selfish and stupid as the baby boomers? I CAN’T WAIT TO TRY AND MAKE FOR MY FRIENDS AND FAMILY. PERFECT FOR GIFT. THANKS A LOT. Wow, I use both plaster and bisque molds but never considered using unfired clay. I’ll probably try it. Between plaster and bisque, I prefer bisque. They are lighter, you can use either the inside or outside, and they nest for storage! I also use plastic and tin bowls and never considered putting the plastic or newspaper onto the slab…I’ve always draped it over the mold, then added the clay. It’s a bit awkward at times. thanks! Lauren, this article is great. Thank you so much for sharing this idea! Also, the comments here are very helpful as well. I can’t wait to try this one out. Thank you for this hugely practical tip! However, allowing for shrinkage wouldn’t the hump be more durable if it was bisqued, and also more hygenic because of the health hazards of ceramic dust? for building my ceramic bowls i always use plastic, stainless still, even glass bowls or whatever shape of look alike bowl i have in my kitchen. (disposable plastic bowls are just perfect). as a matter of fact, my experience in backing helps me a lot when working with clay. to avoid sticking i simply use cooking oil and slightly spray it on the mold i used. the oil can later be absorbed with paper towel. another method i use to prevent sticking and to enable easy release is the plastic wrap. after rolling the slab i attach the plastic wrap to the slab and smooth it to avoid wrinkles, then carefully ( some experience is needed) pull the slab up from the board and lay it on the mold (plastic wrap facing the mold of course). after releasing the clay (leather heard) the wrinkles caused by the plastic can be easily erased by smoothing the inner side (of the clay bowl) with a sponge, or in some cases i intentionally leave the wrinkles as a pattern. when the clay bowl stands now independently on the wheel, i start working on it to form the shape i like to get, by adding coils, discarding parts of the clay and reshaping it or by carefully banding the bowl to the shape i like. I find measuring around a rim awkward.Measuring across with a ruler or tape is easy.Then just multiply by 3.14 for circumference.